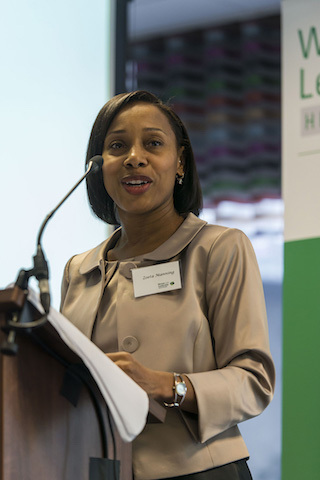 Former MiP chair Zoeta Manning chaired the first Women into Leadership Healthcare event in London on 22 March. The conference, sponsored by MiP, brought together women from all parts of the NHS to explore the role of women in healthcare leadership and offer practical advice and coaching to women on how to develop their careers in times of change. Ruth Passman, head of equality and health inequalities at NHS England, told delegates that women made up a large majority of the NHS workforce but only a small minority of NHS chief executives and trust chairs. Women were particularly under-represented in CCGs, she explained, and were disproportionately affected by NHS restructuring, particularly the abolition of Primary Care Trusts and Strategic Health Authorities. Passman said women thrived in an “open and supportive culture” and needed clear career paths and opportunities for promotion into middle and senior management roles. “We need to shine a light on the traditionally female roles which don’t get the recognition that they deserve… Women need a glass lift to get them through the glass ceiling,” she told delegates. Gill Morgan of NHS Providers spoke about building a culture of inclusion and respect to help female leaders succeed. She said evidence clearly showed that organisations with diverse leaderships and women on boards performed better. “This is a moral and bottom-line issue,” she said. MiP national officer Jo Spear and Sheree Axon, NHS England’s director of organisational change, led a session on ‘parent leaders’ – looking at what unions and employers could do to help parents and their ‘balancing act’ between work and family responsibilities so the NHS could make the most of this valuable and talented workforce. The next Women into Leadership Healthcare event will be held in Manchester on 10 October 2017. For details of this and other future events, visit the Women into Leadership Healthcare website. With the need to create a more inclusive culture high on the NHS agenda, here’s ten tips on how to champion diversity in the workplace.